They know you better than you know yourself, they’re always there when you need them, and they know exactly what you want. Of course, we’re talking about Facebook ads. We all know the feeling of being annoyed and interrupted by advertisements, but there are a number of highly creative and clever Facebook ads that can make you forget that they’re trying to sell you something. There are, however, right and wrong ways of creating Facebook ads. To help ensure you stay on the best path, we took a look at three brands who are doing Facebook advertising right. As a brand established in 1879, Absolut Vodka knows who they are, and they know who their audience is. When Absolut wanted to promote their new Spark bottle, a glittering and illuminated limited edition bottle, they decided to create a series of Facebook ads to achieve their main goal of sparking interest and driving awareness surrounding the product. Along with Facebook’s Creative Shop, Absolut “designed a series of vibrant videos that played to a trendy, high-energy crowd while giving a nod to the brand’s iconic advertising past.” The video ads can be seen on the Facebook Business Success Stories page. To make the campaign successful, Absolut needed to make sure that they were creating their ads in alignment with their strong brand voice, and they needed to consider their audience demographics (ages, geographic location, etc. ), and their interests. Define your brand using three words. What tone do you want to set? Who are you speaking to? Think about what words encapsulate the voice and personality of your brand. Define your niche. Your brand voice is developed by what sets you apart, so pick a few topics that you know better than other brands in your industry, and focus on those to set yourself apart. These topics should be specific, not broad. While Eggo might now bring to mind a certain young psychokinetic Netflix heroine, the brand first became a household name when their 1972 campaign launched the “L’eggo my Eggo” catchphrase. But the kids who loved the original campaign in 1972 are all grown up now, so the brand needed to refresh their image for their new younger audience. 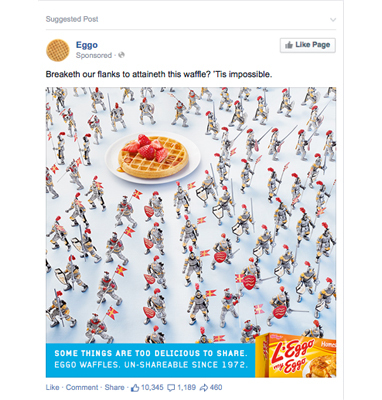 The brand recognized the mobile-first habits of their target audience, and turned to Facebook Ads to bring back the L’Eggo my Eggo campaign. A series of comedic how-to videos (showing Eggo fans how to disguise their Eggo boxes from Eggo thieves) were optimized for Facebook’s mobile and desktop News Feed. The video ads directed people to the Eggo website, where they could download the disguising templates. By ensuring that the ads would be as impactful on mobile as they were on desktop, Eggo was able to revive a campaign that was over four decades old. 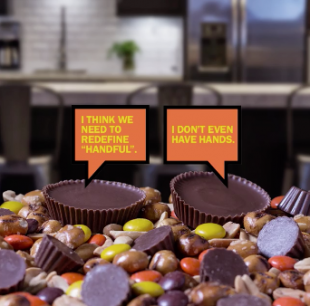 By “refreshing a nostalgic flavor to stay relevant in a mobile world,” the L’Eggo my Eggo campaign contributed to a 4.2 times return on ad spend and a significant increase in revenue. Ensure your Facebook video ads are optimized for silence. As much as 85 percent of Facebook videos are watched with the sound-off due to public mobile Facebook use. Test what works, and what doesn’t. Your audience is always changing slightly, so ensure you keep testing the content of your Facebook Ads to see what is getting responses. Refer to Facebook’s Ad Images Cheat Sheet to get optimal image sizes and best practices for your mobile Facebook Ads. 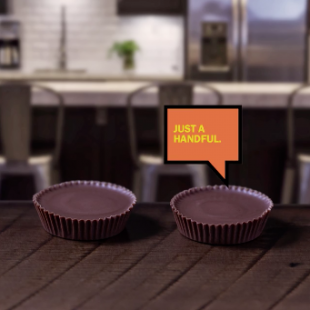 Hershey used the Facebook Ads platform to show a cute and snappy stop motion type video (which could easily be created as a slideshow for your brand if a video isn’t in the cards) showing two of their famous peanut butter cups having a conversation before being joined by the mix. Using humor to draw your audience in. Using authentic characters and relatable situations. While we obviously can’t relate to being peanut butter cups (although what a world that would be), the back and forth between the two peanut butter cups in the ads showed a comedic style of teasing that many can relate to. Having a clear beginning, middle, and end. 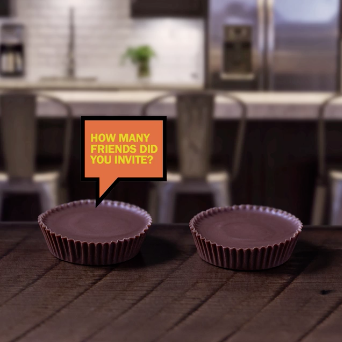 The REESE ad showed a definitive narrative with a text-only screen that stated “Later that night…” which emphasizes the storytelling effect. Advertising can be a tricky realm of marketing to conquer, but with some creativity you can add serious value to your customers’ feeds—and leave a lasting impact.